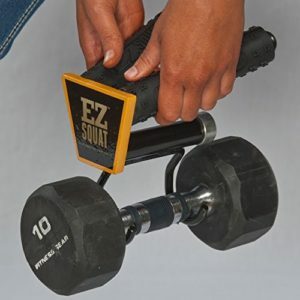 EZ Squat is a “made in USA”, innovative fitness equipment to do squats and dead lifts as the name suggests and this particular combo unit we’re reviewing gives you the ability to work with both plates and dumbbells- weight plates with holes of 2.125 inches or more and dumbbells with handles that are up to 1.75 inches round (regular dumbbells and olympic plates). By doing squats, in a way you will be working every muscle in your whole body, not just your legs, thighs and butts and EZ Squat is designed to let you do efficient, safe and quick squats on your own or in a group class. It ensures you have the optimal form when you’re doing squats, without any negative body contact, which means there will be much less risk of bad posture or strains on your back. You can change the weights very quickly- in a matter of seconds with EZ On and EZ Off with its swivel handles locking when you lift it up and unlocking when you lower it. By using the EZ Squat rather than holding the weight plates or dumbbells directly you will be keeping them away from your spine and close to the centre of your body- centre of gravity at the right angle and the perfect position with its bold rubber anti-slip handles and without any conflicts with your body. Black and yellow EZ Squat has a simplistic design- looks quite basic at first glance but is rather functional and useful for those that like to do squats and dead lifts and weighs only 0.07 pounds so it is quite lightweight. It can hold as many as six Olympic plates at once easily and will work with the most common 200# dumbbells. This is a high quality, heavy duty and functional product that is quite comfy to hold with its ergonomic design, giving you a decent motion range when doing squats and also letting you do T bar rows if used with a barbell and as a pull up or chin up handle. Squatting involves almost every muscle of your body, helping enhance your overall performance, fitness, strength, power and mobility for whatever you need to do during the day and full squats are reported to prevent or fight the chronic muscular or skeletal problems you may have and if you can do a full squat with your own body weight it means you are reasonably fit. 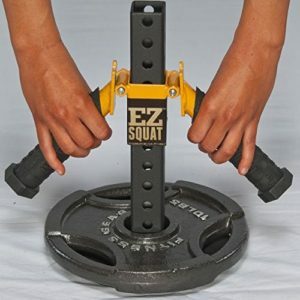 EZ Squat is 500# load rated and is a commercial level, very sturdy and solid unit and is offered with a replacement warranty by the manufacturer- Hypertrophy Enterprises LLC for the life of the product as a very good indication of its superior build quality. You will be paying less by purchasing this 2-in-1 unit rather than the plate and dumbbell units separately.